Canon EOS 5D Mark II owners rejoice! The much acclaimed and anticipated firmware has arrived. First and foremost the best feature is the manual control of the audio input to defeat the almighty AGC. Secondly, the addition of lower resolutions at the correct frame rates and the proper audio frequency of 44khz. Thirdly, the feature of aperture and shutter priority in the Live View video mode. You probably noticed that I used a Canon EOS 1D Mark IV to shoot a Canon EOS 5D Mark II with the new firmware shooting a video I shot with the Canon EOS Rebel T2i. This audio test video has more layers than my favorite Hummingbird Cake at Wright's Bakery in Tampa,FL. Enough of the food references! Are the new features of the 2.0.3 firmware worth the wait? Yes and No. Yes, the manual audio control is a must to fight the evil AGC, but the whole execution of the interface seems like an engineering after thought. Wait a minute! It is in fact an after thought. The camera was released in the U.S. in November 2008 with no intention of having this many video features. I really cannot complain considering how much technology they have packed in this fabulous dslr. My only gripe is at the manual audio control setting in the menu. Once you select manual audio control and scroll below to set the audio level, you have to remind yourself to press set when you are done. 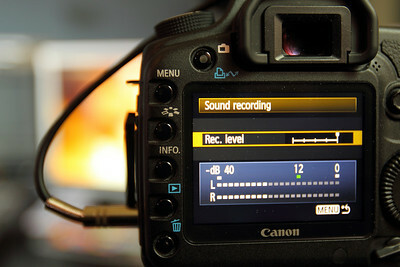 Other wise, your settings will not take effect and the default is zero audio level. Absolute silence and you will not be able to tell because you cannot monitor audio through headphones or visually with meters. Very frustrating. 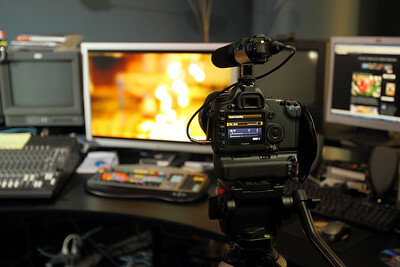 The aperture and shutter priority video modes has much potential. I can finally shoot wide open with the rest of the settings on full auto instead of using my Nikon AF-D lenses with Fotodiox adapter. The extra frame rate and proper audio frequency is a plus, also. To watch the original video that is on the Apple Cinema Display can be found at my Canon EOS Rebel T2i Video Test #3 post. More pictures of the 5D setup are here in my Canon 1D Mark IV gallery.